When cold weather hits, there’s nothing quite as comforting as a bowl of steaming hot chicken soup. This recipe is packed with vegetables which makes it a great source of nutrition as well. Vitamins and minerals boost your immune system to help carry you through the cold and flu season. Of course, our first line of defense is trusting the Lord for divine health. Our second line of defense is taking care of our bodies to promote full functionality and strength. I hope you enjoy this quick easy recipe. It keeps well, for up to a week, in the refrigerator – for a quick lunch or the anchor for an evening meal accompanied by a salad and hot bread. Simmer on low so as to not overcook the veggies – for about an hour or until vegetables are tender. 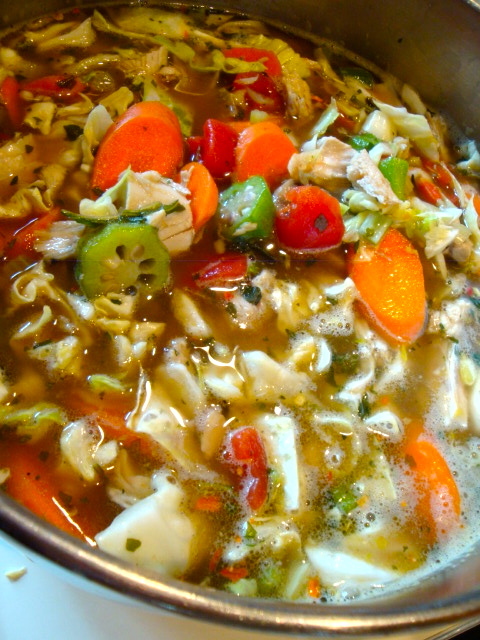 Hi Leann – Made the soup this past weekend – FANTASTIC recipe & so much flavor! Many thanks! I like ham and peas in my pasta. I am keen on salmon loaf with peas in product sauce. So how could I not absolutely adore this dish….better of all worlds. Many thanks for your submit.